1 What Separates Them From Regular Drip Coffee Makers? 3 Should You Get One? With countless cups of coffee consumed daily and a worldwide caffeine craving that will never subside, finding the right coffee maker is a problem numerous people face after they’ve put on their buying pants. The solution is discovering one that fits the proper palate, price and features the buyer covets. While being inundated with options, there are some devices that stand out from the pack and provide maximum quality and experience. A coffee maker with grinder (also called grind and brew coffee maker) is the number one thing to have in your kitchen these days, but what are they and why are they so much more effective at making your favorite cup of fresh coffee? Remember to also read our coffee 101 guide to learn about all the different aspects of the art of coffee making! What Separates Them From Regular Drip Coffee Makers? First, it is important to know the difference between a regular drip coffee maker and grind and brew coffee makers. A regular coffee machine, with brands like Mr. Coffee, Hamilton Beach, and Keurig leading the way, produce its concoctions from pre-ground beans. This means that before you even receive them, the manufacturer has, in essence, ‘prepared’ your coffee. This is done for a myriad of reasons, most notably for speed and price. Coffee that is already ground and packaged is a cheaper alternative to full beans, and the speed at which one can brew a cup is much faster because half of the process is already complete. But, as drink connoisseurs point out, efficiency does not always equal quality – drinking pre-ground brew is not necessarily the most flavorful experience. Ground coffee enthusiasts will tell you that upon grinding, coffee brewing should happen within 2 minutes of the process. The reason why this is noteworthy is because like a flower in bloom, the positive attributes associated with freshness can lose their luster quickly. You don’t have to be a barista to understand that the best coffee is made of freshly ground beans. Units that ground the coffee beans differentiate themselves from normal makers in three ways: flavor, aroma, and experience. Coffee makers with grinders deliver a more visceral, potent flavor. In manipulating the beans, the user of the device has more freedom to construct the taste they want. A wider range of palates are encompassed by the utilization of a grinder because no two ways of grinding are alike. From big beans to tiny grounds, each experience is different, whereas with a traditional device this is not an option with it being prepackaged. The aroma is also different with a grinder than it is with a regular maker. A pungent unmistakable smell when ground, grinding the beans offers an explosive odor as oxygen is interacting with its components for the first time. Since coffee makers with grinders are the freshest way possible to brew, no experience can supercede it. A lot of coffee drinkers embrace the act as a lifestyle, and as such, take great pride in creating their own blends from scratch. If one is more interested in the art of brewing coffee, they undoubtedly prefer devices with grinders. Conversely, these users often think regular makers are too mundane and unimaginative in how they deliver the drink. But what types of devices are the best that include grinders? Breville BES870XL Barista Express Espresso Machine is an outstanding device for those who want to enjoy quality espressos with minimal hassle. With more traditional equal equipment of this quality (separate grinder and espresso machine) making a cup of espresso often becomes a battle between taste and convenience. With a machine of this caliber you’ll never feel the urge to make compromises as this beauty will turn your beans into a fresh cuppa in less than a minute. Breville’s BDC650BSS Grind Control is the choice for those who want to make no compromises whatsoever with their drip coffee. The Breville is programmable, meaning that you can set it to start grinding and brewing at a certain time, and 8 strength settings emphasize its versatility. The LED screen is a particularly useful add on, as it allows you to know grind size and water level in real time. Pre-brew temperature control is perfect for getting the optimum climate for water to be used before brewing. It harbors a removable drip-tray and its 7.5 inch height clearance is ideal for even the most stubborn of cup sizes. What really makes the difference between the Breville BDC650BSS and the lower end coffee makers with grinders is the fact that you have control over the grinding process. This is convenient for people who like to brew several different types of coffee in a multitude of ways. Stainless steel burrs inside the device create a clean, efficient grind to add balance to every cup. The Breville BDC650BSS is the absolute best choice for anyone wanting to indulge in both process and taste. While it may make a hefty impact on your wallet, the durability, reliability, and effortless process make it worthwhile to avid coffee drinkers. Cuisinart DGB-900BC is almost as good as the Breville BDC650BSS but it is not as versatile. The three strength settings (strong, medium, mild) don’t allow as much experimenting as the Breville but are plenty for most users. During our testing period the only complaint we found was the fact that the cleaning process could be easier, but some users have reported having weird issues with the machine – but then again it comes with a three year limited warranty which is plenty to brew with a peace of mind. It also comes with a considerably lower price tag than the Breville. Capresso 464.05 CoffeeTeam GS is almost identical in terms of features as the Cuisinart mentioned above, the most distinguishing feature being the lower size of the carafe. The strength options (strong, medium, mild) and grind options (5 ranging from coarse to fine) provide plenty of versatility for daily use and despite the plasticy look of the machine everything feels rather well made. The grinder of this machine is loud, which is something you might want to keep in mind before purchasing. Yes, grinding beans rarely is a silent operation but this one is particularly noisy. 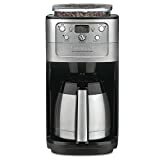 BLACK+DECKER CM5000B is among the most popular budget grind and brew coffee makers out there and for a good reason – the price-to-value ratio is really hard to beat. It certainly is not the flashiest device out there, but it does the job and even offers basic strength settings (strong, bold, regular). The permanent filter with a grinder is surprisingly easy to clean and the grinder is even more surprisingly quiet, which is really rare. Though keep in mind: like we mentioned earlier bean grinding is never the most silent process – quietness is subjective in this case. We’ve read some users reporting leakage after several months of use, which suggests that the built-in quality is somewhat lacking when compared to the higher end models. During our tests we found no evidence of this, but it is something to keep in mind. Being by far the most reviewed item on our list the Cuisinart DGB-625BC is the epitome of a safe pick. The stylish brushed metal finish combined with the streamlined design creates an elegant outlook to match most kitchens out there. It does not offer much in terms of experimenting around with different grinds and strengths (though the 1-4 cup button allows you to have more strength when brewing less than 5 cups) but overall it works just great. With the small details such as the audible tone (to notify you when it’s ready), brew pause (to pour a cup before it’s finished) and grind-off (for using pre-ground coffee) it has some of the functionality of the higher end models, but nothing too fancy. It is just a good, solid choice. The Cuisinart DGB-550BK is an option that offers a 12 cup glass carafe to compliment its ability to be programmed up to 24 hours. Being widely similar to the model mentioned above, choosing between them is up to your eye. With a pause button to stop the flow in mid-brew and auto shut off function between 0 and 4 hours, the 550BK coffeemaker is not lacking in features. The ergonomic handle, knuckle guard and dripless spout combined with programmable timer all round out its capabilities. The Cuisinart grind and brew coffee machine is a choice for the budget conscious shopper who doesn’t want to hurt their wallet but still holds the grinding experience to high merit. The look and feel of the Gourmia is more like the standard devices one would see in a typical home or office. Overall it is a good coffee maker but the fact that the clock is unreliable is a deal-breaker for us – what’s the point in buying this model when you can get one with a clock that holds time perfectly for less money? Yes, the difference is only some minutes in 24 hours but it just bugs us too much that something so simple has been screwed up. Only buy this one if you can find an outstanding deal. Grind and brew coffee makers define a brand new experience for coffee lovers every single day. Even if you are a connoisseur equipped with an espresso maker, coffee grinder and a frother you will learn to appreciate the effectiveness and programmability of an automatic coffee maker in daily life. With magnificent tastes, a vast range of flavor capabilities, and a smell to die for, the value of grinding your own beans from home has never been more beneficial. The best thing about grinders is that options are available to all types of people looking for this particular outlet. Price ranges, brew features and level of involvement vary, allowing for a user of any level of skill to master. Grind and brew coffee makers not only produce an amazing flavor, they blend the personality of the drinker with the overall experience, ensuring ultimate satisfaction whenever you are aching for a cup of coffee.